Here's the finished piece! Still wet on my easel. This pic was taken with my phone so it's not the greatest. I'll be taking some good ones tomorrow and then send them off for approval! It's finally happening! You might remember me mentioning some big studio news about six months ago. 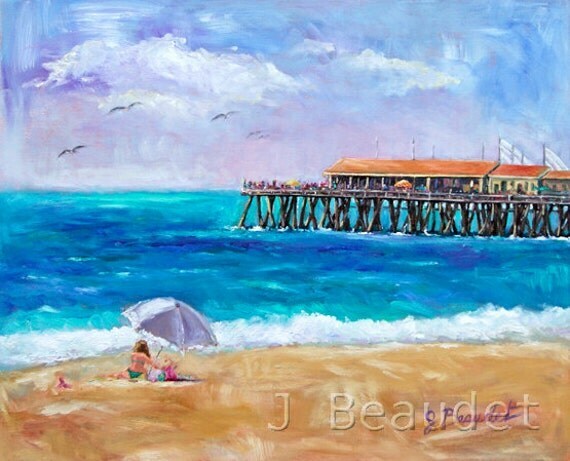 I had been contacted by a restaurant designer and asked if I had any Redondo Beach artwork. 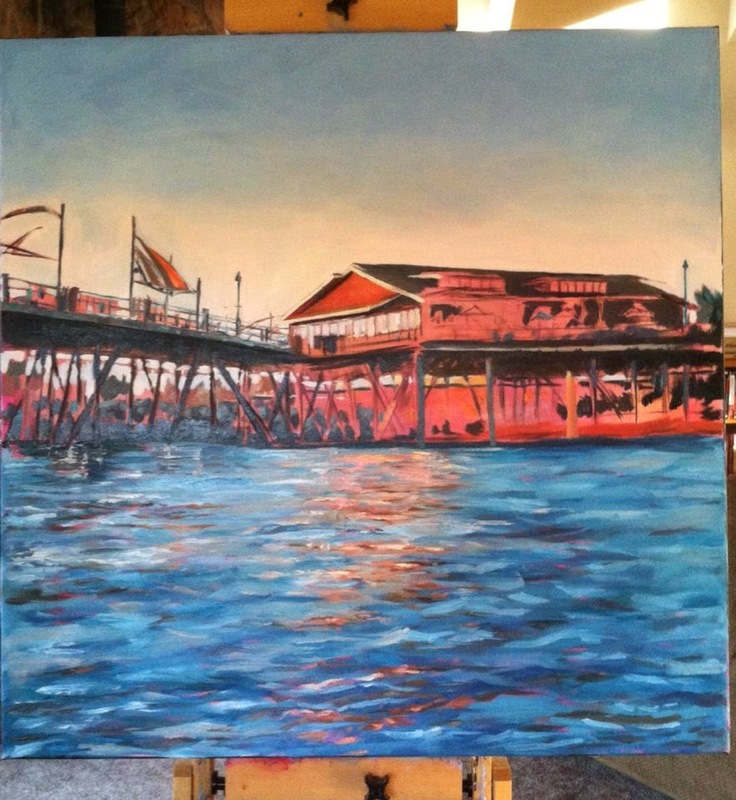 She was in search of new art for an upscale restaurant on the Redondo Beach Pier. If you've been following me from the beginning, you'll know what a big deal this is for me! 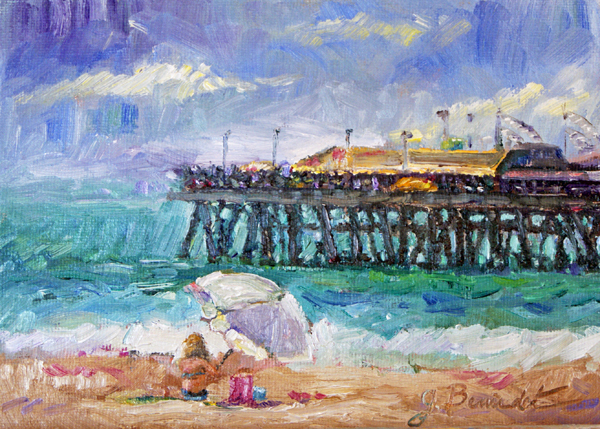 I grew up there, and the pier is always been the first place I go with my daughter when I visit my home. So many good memories there! 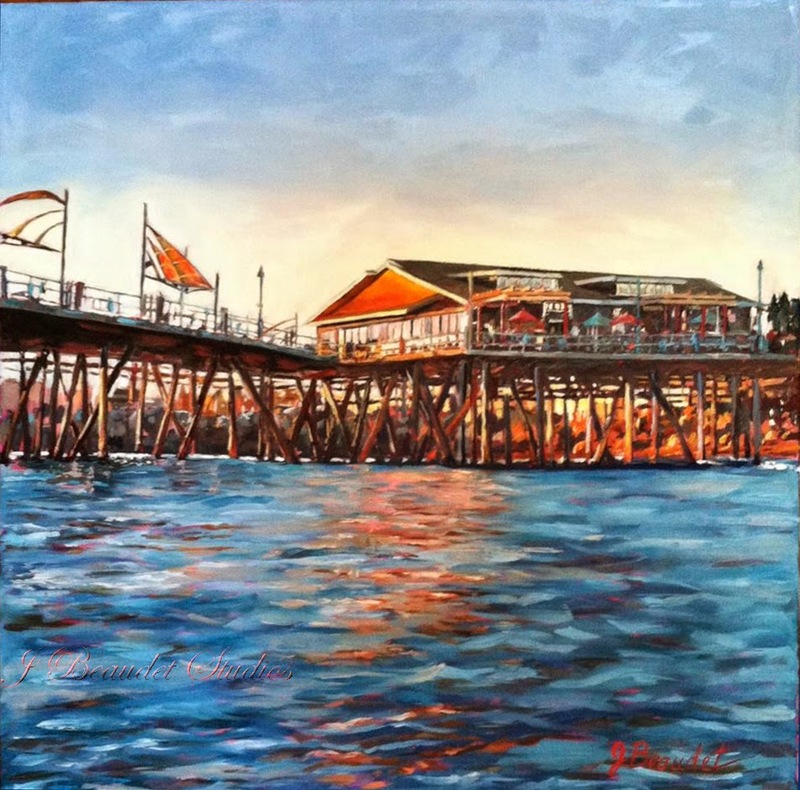 I blogged about the pier back in 2009 and have done several paintings of it. They were interested in buying this one I had already done, but the size wasn't right. There also needed to be three that went together. This was the one she was originally interested in…the one underneath was a smaller version I had painted before I painted a larger one. 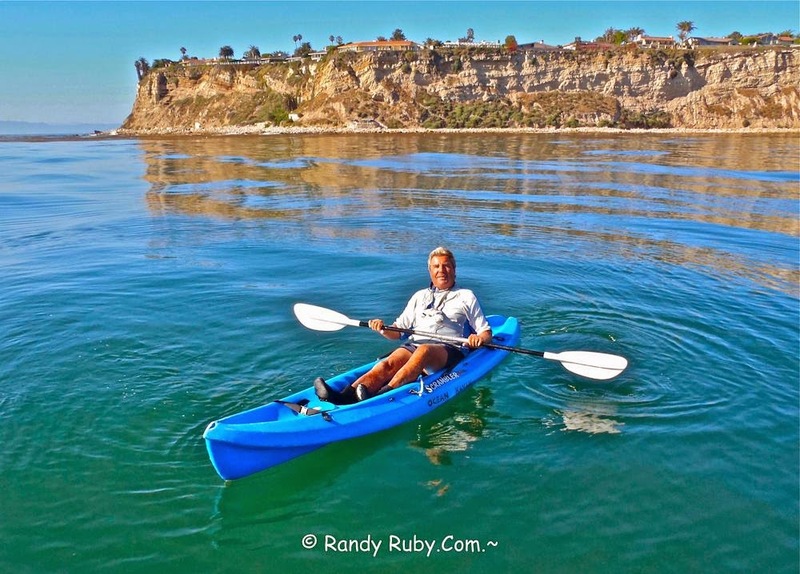 The photographer, Randy Ruby, is kind of famous in the South Bay, and I was already familiar with his work. Actually, I was already friends with him on Facebook! It couldn't have been anymore perfect! It's strange how things work out!Fast forward months later to now, it's finally happening! I'm working on the first one now! There will be three altogether and one of them is the largest size I've ever painted (30x60)! I think I'm saving that one for last. I'll be sharing the progress on here and…if you're in town, maybe you would like to see them in person! They won't be there for about 3 months from now, but I'll let you know when they are! Oh! I guess I should mention what the restaurant is! It's one of the finest restaurants in the South Bay. It's the place my family goes for celebrations. (somehow, I was never present for those celebrations, and have never been!) Anyway, it's a nice steak and seafood restaurant with a gorgeous view of the Pacific Ocean. It's called Kincaid's; you've probably heard of them as they have many other restaurants around the country! Now I'm wondering if this will lead to more! I sure hope so! 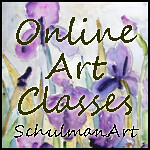 Here's what's on my easel now! I took the photo with my phone, so it's not the best quality. The sky is more blue than it looks right here. Since this one was taken, I've done more work on the pylons and boardwalk, and I'm almost done; just getting ready to start the next one! I'll try to post the finished one tomorrow. Happy 4th of July Weekend to all my friends in the US! I have to also mention that this is my birthday month and I'm already starting to celebrate! What joyful news for you, my dear artist friend. God is blessing you with this work which will add to the beauty of the restaurant. Well done. Super news! Look forward to seeing them in progress. Congratulations! JENNIFER! 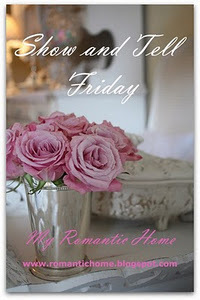 My friend, I was without internet for 24 hours due to a storm yesterday! I now have seen your comment and visit, and I thank you so much for coming over! YOUR PAINTING is stunning! 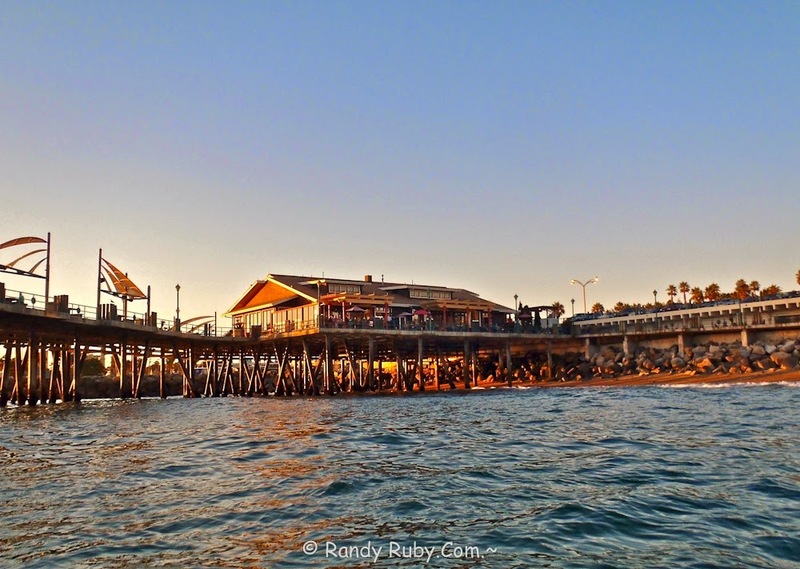 I love the water, and of Redondo Beach pier? YES YES YES! Your colors are striking and I'm glad to know that you are greatly appreciated! Just yesterday we had guests at the house, and the gentleman who came over was admiring the portrait you painted for me of Les Trois Dames....he really loved your work, and I enjoy this piece every day as I spend a lot of time in my studio. I hope you're all safe after the storm Anita! 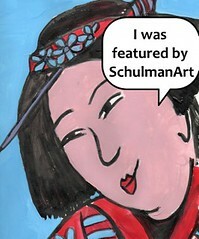 Thanks so much for your sweet comments about my latest painting! I love hearing about your guests review of our creation! That was a lot of fun to interpret your vision! I need to do a post on the whole process and show your beautiful portrait!